Home » Biology , Cell , Cell Organelles , Lysosome » Lysosome is formed from which of the following cell organelles? 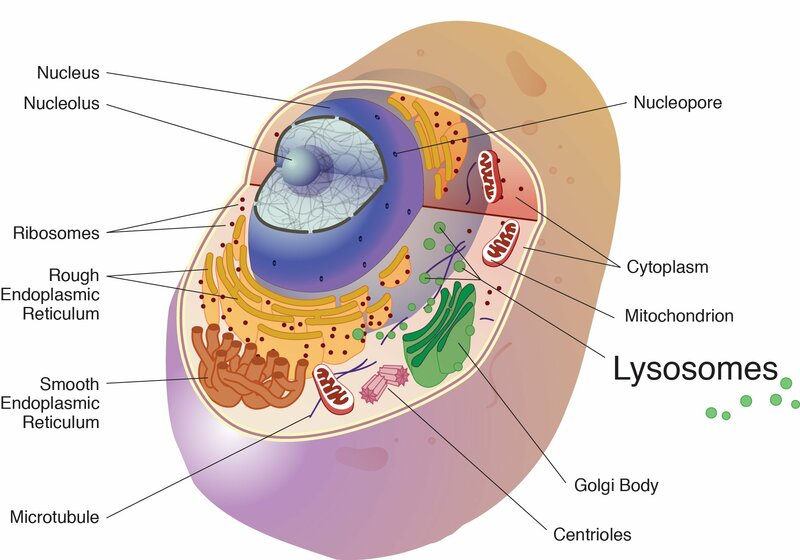 Lysosome is formed from which of the following cell organelles? Q. Lysosome is formed from which of the following cell organelles? There are two primary types of cells: prokaryotic and eukaryotic cells. Lysosomes are organelles that are found in most animal cells and act as the digesters of a eukaryotic cell. Lysosomes are spherical membranous sacs of enzymes. These enzymes are acidic hydrolase enzymes that can digest cellular macromolecules. The lysosome membrane helps to keep its internal compartment acidic and separates the digestive enzymes from the rest of the cell. Lysosome enzymes are made by proteins from the endoplasmic reticulum and enclosed within vesicles by the Golgi apparatus. Lysosomes are formed by budding from the Golgi complex. Lysosomes contain various hydrolytic enzymes (around 50 different enzymes) that are capable of digesting nucleic acids, polysaccharides, lipids, and proteins. The inside of a lysosome is kept acidic as the enzymes within work best in an acidic environment. If a lysosome's integrity is compromised, the enzymes would not be very harmful in the cell's neutral cytosol. Lysosomes are formed from the fusion of vesicles from the Golgi complex with endosomes. Endosomes are vesicles that are formed by endocytosis as a section of the plasma membrane pinches off and is internalized by the cell. In this process, extracellular material is taken up by the cell. As endosomes mature, they become known as late endosomes. Late endosomes fuse with transport vesicles from the Golgi that contain acid hydrolases. Once fused, these endosomes eventually develop into lysosomes. Lysosomes act as the "garbage disposal" of a cell. They are active in recycling the cell's organic material and in the intracellular digestion of macromolecules. Some cells, such as white blood cells, have many more lysosomes than others. These cells destroy bacteria, dead cells, cancerous cells, and foreign matter through cell digestion. Macrophages engulf matter by phagocytosis and enclose it within a vesicle called a phagosome. Lysosomes within the macrophage fuse with the phagosome releasing their enzymes and forming what is known as a phagolysosome. The internalized material is digested within the phagolysosome. Lysosomes are also necessary for the degradation of internal cell components such as organelles. In many organisms, lysosomes are also involved in programmed cell death. In humans, a variety of inherited conditions can affect lysosomes. These gene mutation defects are called storage diseases and include Pompe's disease, Hurler Syndrome and Tay-Sachs disease. People with these disorders are missing one or more of the lysosomal hydrolytic enzymes. This results in the inability of macromolecules to be properly metabolized within the body. Thanks for reading Lysosome is formed from which of the following cell organelles?